Take a look at the new web page I am hosting. It is called "Discipleship.chccsa.com" and is a page linked to our church web site intended for growing Christians and populated with articles growing Christians might want to read. This is a part of our new discipleship emphasis which we will unveil soon at Castle Hills Christian Church. The only way for a human being to know anything about God is for Him to reveal himself in some way. Fortunately for us, God has chosen to do that very thing. The Bible is God’s revelation of Himself and his plan for mankind. The Bible lets us know that God is love, and that he is all about having a close relationship with his creation. Genesis, the first book of the Bible tells about God’s creation of the world and the first humans he placed within a beautiful garden called Eden. Everything needed for human life was within that garden, and God himself, would enter the garden and speak to the two humans, Adam and Eve, every day in the cool of the evening. There was unbroken fellowship between God and mankind, and God directly provided all that was needed. Within the garden, God planted two special trees. The first was called the “Tree of Life,” and as long as Adam and Eve remained in fellowship with God they could eat freely of this tree and live forever in fellowship with God. But God also planted another tree in the garden and called it the “Tree of the Knowledge of Good and Evil.” God told Adam and Eve that whenever they ate of that tree they would die. No doubt, you may wonder why God would bother to put the second tree in the garden. He had a good reason for putting it there, which will be revealed soon. Meanwhile, life in the garden was perfect in every way. God provided all that was needed, and the humans enjoyed every advantage that came with unbroken connection to God, their creator and sustainer. A new character enters the picture at this point. Satan, in the form of a serpent, arrives to put the human couple to the test. Though we may be tempted to blame everything that is about to happen on this evil intruder, we need to realize that God allowed his presence in the garden and was aware of what he would soon do. The serpent was nothing more than a catalyst to bring to light what was already stirring within the hearts of the humans, and the tree of knowledge was actually a tree of testing. You see, God created free moral agents when he created the humans. They had the power to obey or disobey God as they might choose. Providing the second tree was God’s way to allow mankind the freedom to use the power of choice to either stay connected with God willingly, or to separate themselves from God and go their own way. In eating the fruit of the second tree, they chose the path of separation from God. The testing tree allowed the humans to taste disobedience for themselves so that they could literally know the difference between good and evil by experience. From the very moment of mankind’s fall, God was busy working out a plan for mankind’s redemption and restoration. When God found Adam and Eve naked, he killed an animal and provided them with proper coverings even though they had tried on their own to cover their nakedness with fig leaves (an example of man’s puny religious attempts to cover his own shame). In this action God began a system of blood sacrifices to atone for sin. Already, God was working to reconnect man back to himself, but he had an ultimate plan in mind to take care of sin once and for all. From the moment of Man’s fall, God began to reveal his plan to redeem mankind back to himself (Genesis 3:15). At just the right time in history God put on flesh, entered into time and space as a human baby, and lived a perfect life, thereby enabling himself to become a perfect and final sacrifice for sin. John’s gospel tells us about the life of the extraordinary man named Jesus, from a town called Nazareth in a region called Galilee. He was the one the Jews were looking for whom they called “Messiah” and Christians later called “Christ”. His entire life is worth careful study, but the greatest thing he did for mankind involves the third tree. This tree didn’t look anything like a tree, but it came from chopping down a tree to fashion a instrument of torture and death the Romans called a cross. Jesus was condemned to death by the cruel actions of godless men who, in a frenzy, shouted out “Crucify Him!” Jesus had done nothing worthy of death, but he was killed anyway. This would all seem pointless if it weren’t for the fact that God had planned this as his method of redeeming the world. He literally became his own blood sacrifice to atone once and for all for every sin mankind would ever commit. We know from ancient prophecies in the Old Testament that dying by crucifixion was always God’s plan to redeem mankind. Passages like Psalm 22 and Isaiah 53 which were written between 700 to 950 years before the events of Christ’s death on the cross are examples to show us this was always God’s plan for redemption. With Christ I am now able to have my mind focused, not on the flesh, but on the Spirit which is life and peace (Romans 8) because God has enlivened my spirit and placed His Holy Spirit within it. There is a fourth tree mentioned in the Bible. This tree is the same tree we saw once before in Genesis. The tree is called the “Tree of Life” and we notice that what was denied to Adam and Eve in the garden of Eden, is prominently displayed in heaven. Notice the words of Revelation 22:2, “down the middle of the great street of the city. On each side of the river stood the tree of life, bearing twelve crops of fruit, yielding its fruit every month. And the leaves of the tree are for the healing of the nations. I admit that I am baffled as to how the one “tree of life” can be on “each side of the river,” But I am looking forward to eating a different crop of fruit each month from that tree which will be available to everyone living in the heavenly city. Notice that what was lost in Eden will be fully restored and then some in the heavenly city. Surely, you must want what is promised here to be available to you and those you love. By receiving Christ as your Savior and Lord you can enjoy the bounty of that fourth tree (which was actually the first tree), and you can erase the curse of the second tree by connecting with the man who hung on the third tree. Please don’t let this remain unfinished business in your life. Receive the gift of salvation today through the sacrifice of Jesus Christ on the cross. I have come up with my own diet which seems to be working at the moment. I call it the "Simpleton Diet" because it is so simple any simpleton can figure it out. There is one rule to the simpleton diet: Eat one item per meal. What do I mean by that? I mean, "Eat one item per meal." Most people eat several items per meal. For example, the average restaurant meal has a main dish usually containing meat, and one or two side items (veggies, fries, etc.) My diet involves eating one thing per meal. Today I had a bowl of oatmeal for breakfast (one item). Then for lunch went to a Greek restaurant and ordered a Gyro. It came with fries or chips on the order so I chose chips and took them home rather than eat them. Susan brought home Pizza for supper and I had a piece. Get it? One item. So what is the idea of eating one item? Simple. Eating one Item is less food than eating a plate of food. 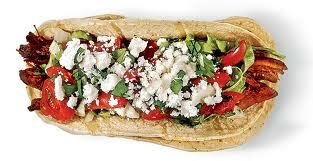 The problem with the American diet is that we usually eat too much food. I read that the average American eats over 100 lbs of sugar a year and about 65 lbs of fat per year. No wonder we are diabetic and stuffed with cellulite. So the answer is to eat less food. What about nutrition, vitamins, minerals, etc.? Eat a variety of items per day. Like everyone else, I am an omnivore so I don't eat the same thing throughout the day. I learned a version of this diet years ago when I learned about the Weighdown Workshop (Gwen Shamblin). She advised eating only when truly hungry. Unfortunately, for me, that was all the time. But she taught the wisdom of eating smaller portions and sticking only to what you truly like to eat and avoiding the rest. She warned that we had been improperly taught by parents to clean our plates. We were wiser if we left food on the plate and forget the parental rebuke about the starving kids in Africa. Since I generally eat what ever is set before me, the trick is to see to it that less is set before me. I believe that most of the time, one item is enough. If I get hungry ("true body hunger" as Gwen called it) I can eat a piece of fruit or a few nuts. Anyway, I'm gonna give it a whirl. Being something of a simpleton myself, I must have a diet program that is a no brainer. So far, I'm about 9 lbs. lighter. I'll keep you posted about my progress if you need to know. Let me know if you decide to join me in my simpleton ways. Just a thought. In his message Sunday, my co-pastor, Ronnie Morgan mentioned a prayer Campus minister, Roy Weece would pray daily. Though I don't remember the exact wording, it was something like this. "Lord, bring three people my way today with whom I can share the love of Jesus." The very next day He shared with me a story about a guy at the fitness center who spoke to him and told him about a doctor's report he had gotten telling him he had prostate cancer. Ronnie was able to speak comfort and encouragement to him right there and then. I think so often we miss out on ministry opportunities because we have conditioned ourselves not to expect them. Therefore, they seldom happen. Perhaps if we changed what we expect; what we pray for, then we would see a change in the happenings of our daily experience. 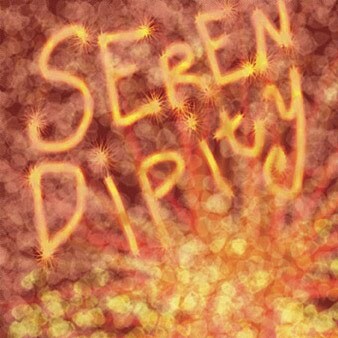 As for me, I'm all up for adventure, God-incidences, fortuity, God-winks, serendipity, blessing, happenstance. What ever you call it; bring it on! My new book is now for sale! My new book is now officially for sale on Lulu.com. 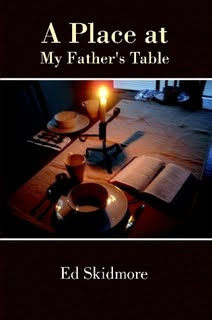 If you want to find it, log into Lulu.com and do a search for the title: A Place at my Father's Table. The paperback book is available on Lulu for $12.97 plus postage, or as a down-loadable e-book for $5.95. In about two weeks I will also have books available myself at a discounted price. You can contact me at edskidmore@sbcglobal.net if you want to order through me starting about the 5th of August. This is a devotional book with 89 devotions in it that started out as articles in the Communicator News Letter starting back in 1985 through this year with articles on this blog. What I've worked on ever since the start of the year is now available for general distribution through Lulu.com and will eventually be available on Barnes and Noble and Amazon in about 2 months. Why not check it out on Lulu now. I am in the process of getting a book ready to be published and have been focused on it to the exclusion of other things (like this blog for the past month or so). At the same time, I have also started working on another book I would like to publish sometime next year. Attempting to carve out time, energy, and inspiration to work in the next book has taught me some lessons. I have noticed three powerful barriers to getting that task done. The first and more obvious barrier is that of finding time available to focus on writing. I have walked into my office intending to give a block of time to the writing task only to have a half dozen other things come to my mind that need to be tended to. My desire to write gets buried under an avalanche of expediencies. Thinking that my office is the proper place to do this work because my books are there along with my other completed sermons and lessons from which to draw material, I discover that my office is one big cubicle of undone tasks begging for my attention. Well, I can fix that. I'll just go home and write there; but distractions abound there as well. Along that line, I find that I need a size-able block of hours to be able to focus and get a few pages put on paper. I just can't cram this kind of work into little half hour snippets because, for me, there is a need for revving up, so to speak, to get a flow to my writing. Interruptions put me into neutral, and I have to start over in first gear. Along with the time element is another equally weighty issue to writing. The energy element cannot be ignored. Sometimes I am just too tired to write. When this becomes my condition, I am just as likely to snooze off as to get words on the screen. I know that some people get up at the early hours before phones ring and people are running around demanding things. I wish I was one of those who needed minuscule amounts of sleep. Unfortunately, I am on the other end of the sleep spectrum. Anything less than 7 hours of sleep per night, and I am a zombie the next morning. Thinking I would write today, I awoke at 6 a.m., closed my eyes to rest just a minute, then opened them again at 8. Oh boy! Afternoon hours are sometimes unproductive for the same reason. The after lunch malaise sets in and my brain gets foggy. If I try to read then, I may just read the same sentence over and over again.... for a half hour. I have to time writing when I have the energy to get things done with a clear head, and the ability to focus. By the way, am I the only one finding it increasingly difficult to focus in this advancing period of my life? ... Let's see, where was I? The final element needed for writing is what some call "the muse" and we religious types call "unction" While sometimes I am too drained of energy to write, other times I have an empty head. I am ready to write but nothing comes to mind. The inspiration just isn't there. I guess that's what some call "writer's block". I've noticed that in the arena of ideas I simply must get beyond my own brain to find edifying content for my writing. That means research, which is what you call it when you steal ideas from more than one source; otherwise it would be plagiarism. I have also learned that by means of daily contact with the Holy Spirit who resides in my own spirit, I am given insights and gleanings to make me a slightly more mature believer with each passing day. I am reminded of 2 Cor. 3:18, "And we, who with unveiled faces all reflect the Lord's glory, are being transformed into his likeness with ever increasing glory, which comes from the Lord, who is the Spirit." By means of that connection, I not only grow towards maturity, but I have more inside my mind to communicate through speaking or writing. So there it is: time, energy, and inspiration; the big three when it comes to transferring thoughts from cranium to paper or computer screen. I am hoping that today will be one of those days when all three will be present. Just a literary thought. The shepherd’s psalm has been the most memorized and most beloved poetry in the Bible because of the rich metaphor we find there. Being a lover of food myself, I appreciate anything to do with eating. Therefore, I am drawn to the words, “You prepare a table before me in the presence of my enemies.” (vs. 5, NIV) I am able to eat in peace even though a wolf, or bear, or lion may be in the vicinity because the shepherd is watchful. This particular phrase is a mixed metaphor because we know that sheep don’t eat from tables. But humans can appreciate the fact that a place at the table has been reserved for them. For us, the one in charge is more than a shepherd. He is the one who has adopted us into his heavenly family. There is something powerful about time spent together at the table. Therefore, I am grateful to know that my Father’s table has a place set exclusively for me, and I am able to dine there regularly at the Father’s invitation. "Wherefore the law was our schoolmaster to bring us unto Christ, that we might be justified by faith" (Gal. 3:24, KJV). It is interesting to discover that God instituted the Levitical law for the purpose of walking us to the feet of Christ. It was never intended to be an eternal covenant by the simple fact that it was a conditional (if-then) covenant. Any covenant with conditions can be nullified by the person who breaks the terms of the covenant. And as Bible history clearly shows, the Jewish nation broke the terms of the covenant repeatedly. But, as Paul explains in Galatians, the law was given for the purpose of showing wayward people their need for something better than the law. It was God's plan to provide grace as a gift at just the right time through his one and only Son and his finished work on the cross. In fact, I love Paul's words in Colossians concerning the written code of the law when he wrote in Colossians 2:14 (NIV) having canceled the written code, with its regulations, that was against us and that stood opposed to us; he took it away, nailing it to the cross. We see then, that the law served the same function as the household slave who walks the children to school and deposits them into the presence of the teacher. That is what a "pedagogos" was; not the teacher himself, but merely, the slave who took the children to the place where they could be taught. The Levitical law walked us wayward children into the presence of Christ by revealing to us that we were ill equipped to keep the law in and of ourselves. In fact, attempting to keep the law was never anything other than an effort in futility. But until we tried and failed, we didn't realize how badly we were in need of imparted grace and imputed righteousness that only Christ could give. Praise God! The schoolmaster has finished its work. It has walked us up to the foot of the cross and deposited us at the feet of the Lamb of God who took away the sin of the world. The master has come, so the slave is no longer needed. Now we are justified by faith apart from the law! I received an a-mail today from a friend in ministry who has served in missionary work among tribal people in Africa. He was back among the people he had ministered to for about two decades finishing up a Bible translation project and working with a long term native ministry partner. He mentioned in his e-mail that he had just finished preaching the "most embarrassing sermon" he had ever preached to these tribal people concerning a topic he had avoided for all his years on the field. His tribal friend had begged him to preach to his people about female circumcision after his own daughter was taken against his will and secretly circumcised without his permission. This practice, normally carried out largely in Muslim circles all over Africa and the middle east, would be considered child abuse if it were practiced here. I won't get into the details of this in this blog, but you can Google it if you want more information. My friend concluded his e-mail with these words, "It may be a while before the subject is fully worked out among the people here. Maybe a generation, maybe this generation. Pray for God to give us all wisdom." I wrote back to the brother who sent the e-mail to encourage him for dealing with such a difficult task. I had observed the same issue while visiting missionaries in Kenya who were working among Maasai tribals in the Mara area of west Kenya. Along with female circumcision, they also had another similar issue regarding a common practice of removing the two bottom teeth of Maasai children. Back when that practice started, removal of the two middle bottom teeth allowed a straw to be inserted into the mouth of a person suffering with lock-jaw so they could get nourishment in spite of the disease. But no one has suffered lock-jaw there for nearly a century. Still the practice persists today, and children are taken, without warning, and a spoon is inserted between the bottom teeth, and the two teeth are literally scooped out without anesthetic by a man in the tribe who has become proficient at the primitive tooth extraction method. 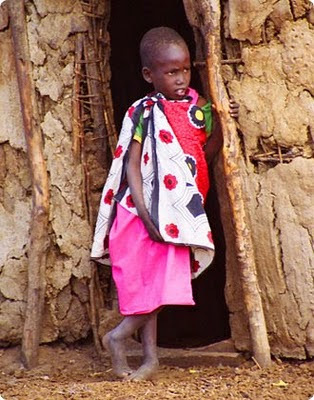 It amounts to child abuse in my mind, but looking at Maasai tribals, evidently all of them have gone through the procedure. people, but it is a poor exhibition of what Christ can do to change inappropriate behaviors. I call to mind the oriental practice of foot-binding that is no longer endured by girls. Even non-Christians can eventually catch on as to what is harmful and unloving practice to foist on children in the name of tradition. I applaud my friend for bringing it up, uncomfortable though it may have been. Female circumcision is a middle-eastern (Muslim) abomination. The sooner it is stopped the better. It took William Wilberforce a lifetime to abolish slavery in the UK, but it was worth all the effort and time on his part. Girls and women in Africa and the Middle-East will thank those who speak up against such barbaric practices in the years to come. We must not be embarrassed to speak out for the innocent ones subjected to foolish practices in the name of tradition.